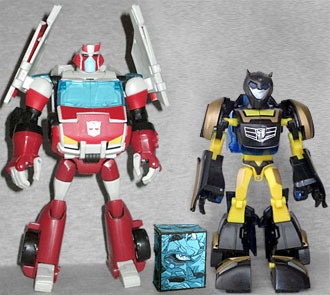 Remember that time when Walmart had Deluxe-class Transformers priced at $7.77 for, like, an entire year? Or more? Truly, it was a golden age! Now the size class goes for at least twice that, which is why today I'm reviewing a TF that got spit out of my printer for free. 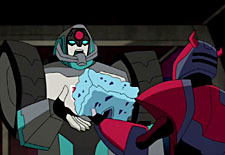 At the end of the Transformers Animated episode "TransWarped," Autobot espionage agent Blurr was cornered by Shockwave and crushed into a cube. Aww, sad! The last we saw of the Blurrcube, Cliffjumper was dumping it into a waste chute, to be finally disposed of. Aww, sadder! But here's the thing: in Animated, when Transformers die, they turn black and white (a nod to what happened to Optimus Prime in Transformers: the Movie). Blurr, even after being encubified, was still his traditional pale blue, meaning that he was still alive! Yay! At least, he was before he was thrown into the incinerator. Yay? Derrick J. Wyatt even made sure Blurr's "still-beating Spark" was visible in the model (though the episode only used the "simplified" version of the model, so it wasn't seen on-screen), so technically, the last we saw of Blurr, he was alive, just badly, badly injured. And being thrown down a chute to his almost-certain doom. Despite all the mentions of a "cube," the shape is actually rectangular, measuring 1½" wide, 1¼" tall, and 13/16" deep. There are heavy black lines along each edge, which seem unnecessary - were they an attempt to fake the outlines animation required? Whatever they are, they're not great. But counterpoint: this is a crushed Blurr you can have your other Animated figures hold, who cares if there are lines on his edges? 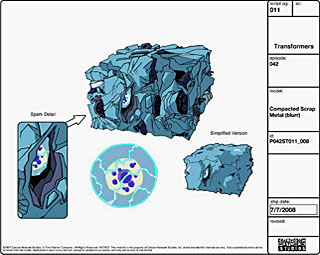 Blurr's fate was left unresolved when Transformers Animated ended - like Veruca Salt, it all depended on whether or not the furnace was on that day. But at Botcon 2015, the script reading featured a story called "The Return of Blurr," along with some new art to illustrate it. It even crosses over with "The Stunti-Con Job"! Yeah, the only reason you're reading this review is because I like Transformers enough to want to deliver you a Transformers Tuesday, but I don't like it enough as a property to pay $7 more than I should for a $10 toy; or maybe $5 more than I should for a $12 toy, but that's stretching it. So while I wait and hope for TF5 Cogman to show up anywhere, or for some store to have another good sale on Generations, we'll just have to stretch out the run-time of this bi-weekly feature with a folded piece of paper. One that's darn fun.